The Banquet Center at Anthony’s provides a formal, yet fun ambiance complete with the finest amenities available today. We offer sit-down, station-style or butlered service for family occasions and corporate events of up to 350 guests. 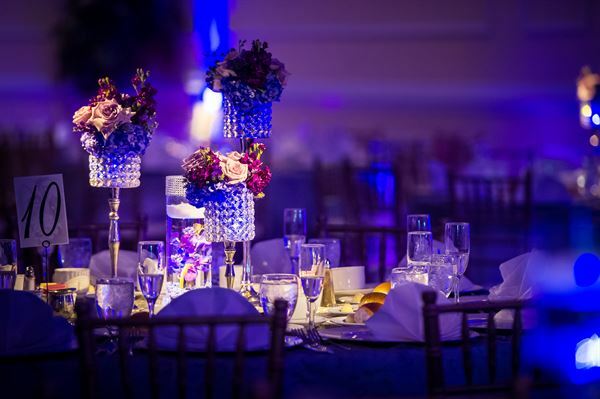 For weddings, a choice of linens and centerpieces are at your discretion. Ceremonies are also accommodated at Anthony’s. Please contact us for more details. Every main course, hors d’oeuvre, dessert and wedding cake is skillfully prepared on premises by our trained kitchen staff. Guests can choose from a wide variety of entrées that are sure to please. Sit Down Menu: $19.95 per person Includes potato and vegetable du jour, rolls and butter, coffee, hot tea, and vanilla ice cream. Choose One Appetizer: Homemade Chicken Escarole Caesar or Garden Salad Choose Two Entrees: Chicken Francaise Chicken Marsala Chicken or Veal Parmigiana over Penne Pasta Crab Cakes Stuffed Chicken Breast with Mashed Potatoes Chicken Saltimbocca Broiled Flounder Brouiled Slamon 8oz Petite Filets ($21.00) Prime Rib ($21.00) Buffet Menu: $19.95 per person Includes tossed salad, oven roasted potatoes, fresh vegetables, rolls and butter, condiments, coffee, hot tea, and vanilla ice cream. Choose Three Entrees: Chicken Marsala Chicken Piccante Roasted Rosemary Chicken Veal Scallopini Stuffed Shells Sausage and Peppers Penne alla Vodka Rigatoni Stuffed Flounder Roast Beef Roast Pork Eggplant Parmigiana All parties subject to 6% PA sales tax plus 18% gratuity. Sit Down Menu: $20.95 per person Includes house salad, potatoes, vegetable, coffee, hot tea, and vanilla ice cream. Choose Two Entrees: Chicken Francaise Sauteed in a light egg batter finished in a lemon wine sauce Chicken Marsala Sauteed in a mushroom Marsala wine sauce Chicken or Veal Parmigiana Bread and lightly fried, topped with provolone cheese and Anthony's red gravy Eggplant Parmigiana, "The Best" Served with a side of penne marinara Broiled Flounder Served with fresh lemon Baked Salmon Served with tomato basil sauce Crab Cakes No fillers with risotto in a lobster cream sauce Buffet Menu: $20.95 per person Includes house salad, bread, butter, condiments, coffee, hot tea, potatoes, and vegetable du jour. Choose Three Entrees: Stuffed Shells Manicotti Penne alla Vodka Roasted Chicken Chicken Marsala Chicken Piccante Eggplant Parmigiana Stuffed Flounder Roast BEef Roast Pork Veal Scallopini Rigatoni Bowtie Pasta with Peas and Prosciutto Alfredo Extra Amenities: Hot Appetizers $7.00 per person Shrimp Lejon, Stuffed Mushrooms, Clams Casino, Coconut Shrimp, Chicken Cordon Bleu Bites Cold Crudite $4.50 per person Grilled Vegetables, Fresh Fruit, Bruschetta, Imported Cheeses Carafe of Wine $20.00 Red, White, or White Zinfandel Mimosa or Champagne Fountain $3.75 per person All parties subject to 6% PA sales tax plus 18% gratuity. Choose One: Caesar Salad Escarole Soup Garden Salad Pasta Course: Chef's Choice (complimentary) Select Two of the Following: Chicken Marsala $24 Sauteed boneless breast with mushroom in a Marsala wine sauce Chicken Francaise $24 sauteed in a light egg batter finished in a lemon wine sauce Chicken Parmigiana $24 Bread and lightly fried topped with provolone cheese and Anthony's red gravy Veal Parmigiana $25 Breaded and light fried topped with provolone cheese and Anthony's red gravy Veal Anthony $25 Sauteed medallions with shrimp, mushrooms, in a Madeira wine sauce 9oz Filet Mgnon $30 Served with a Marsala wine sauce Stuffed Flounder $26 Stuffed with crab imperial Crab Cakes $26 Served with risotto and a lobster cream sauce Baked Salmon $25 Served in a afresh tomato and basil sauce Broiled Seafood Combo $30 Stuffed flounder, shrimp scallops, and a 4oz lobster tail Bar Arrangements: Soda Priced Accordingly (ask manager) Tab Bar (consumption tab) Cash Bar ($40 Bartender Fee) Open Bar ($20 per person) Four Hours Carafes of Wine- Chablis, Chianti, White Zinfandel $20 All parites subject to 6% PA Sales tax plus 18% gratuity. Buffet Includes: Bread, Butter, Condiments, Coffee, Hot Tea, and Vanilla Ice Cream Choose 3 ($24.95) Choose 4 ($25.95) Choose One from Below: Caesar Salad Escarole Soup Garden Salad Entree Selections: Chicken Piccante Sauteed boneless breast in a lemon wine sauce Chicken Marsala Sauteed in a mushroom Marsala wine sauce Roasted Chicken Rigatoni In Anthony's red Gravy Rigatoni Broccoli Rabe aglio Roast Beef Sandwich Roast Pork Stuffed Shells Lasagna Eggplant Parmigiana Penne Vodka Veal Scallopini Sausage & Peppers Flounded Stuffed with Crab Imperial Choose Two: Green Bean Almondine Mashed Potatoes Vegetable Medley Oven Roasted Red Bliss Potatoes Bar Arrangements: Soda Priced Accordingly (ask manager) Tab Bar (consumption tab) Cash Bar ($40.00 Bartender Fee) Open Bar ($20 per person) Four Hours Carafes of Wine- Chablis, Chianti, White Zinfandel $20 All parties subject to 6% PA sales tax plus 18% gratuity. Your Five Hour Wedding Reception will Include the Following: Four or Five Hour Open Bar Champagne Toast One Hour Hot and Cold Hors D'oeuvres Sit-Down or Buffet Dinner Menu White Table Cover with A choice of Napkins Maitre d' to Supervise Your Reception *State Tax and Service Charge Included Your Premium Cocktail Hour Will Begin with the Following: Hot Hors D'œuvres: Please Choose Seven Shrimp Lejon Spanikopita Clams Casino Scallops Wrapped in Bacon Mini Crab Balls Chicken Cordon Bleu Bites Vegetable Spring Rolls Sesame Chicken Strips Coconut Shrimp Crab Stuffed Mushrooms Cold Crudite' Display: A lavish display of fresh grilled vegetables, Bruschetta and an assortment of imported and domestic cheeses and also seasonal fresh fruit accompanied by a variety of dipping sauces. Entrèe Selections: Chicken Francaise Pan Seared Boneless Breast Dipped in an Egg Batter Finished in a Lemon White Wine Sauce Chicken Marsala Boneless Breast Sauteed with Wild Mushrooms in a Marsala Wine Sauce Stuffed Capon Boneless Breast with Seasoned Bread Stuffing, Finished in a Supreme Sauce 10oz. Center Cut Filet Mignon Char-Grilled to Perfection with a Marsala Demi-Glace Prime Rib Cooked to Perfection, Served in Au Jus Surf and Turf 8oz. Filet Mignon and Crab Cake with Crab Imperial, Broiled to Perfection Crab Cakes Sauteed Lump Crab Cakes with No Filler Finished in a Lobster Creme Sauce Broiled Atlantic Salmon Seasoned with White Wine and Butter Topped With Fresh Tomato Basil Sauce Starches: Please Choose One Twice Baked Potato Herb Roasted Red Skin Potatoes Potatoes Au Gratin Vegetables: Please Choose One Whole Fresh Green Beans Sauteed Asparagus Gourmet Roasted Vegetable Bundle Upgrades: Cocktail Hour Stations: (These stations include elaborate ice sculpture) Jewels of the Sea Raw Bar Crab claws, jumbo shrimp cocktail, fresh shucked cherrystone clams and blue point oysters on the half shell will be served with cocktail sauce, fresh lemons, and tabasco sauce. Vodka Martini and Cosmopolitan Bar Chilled flavored vodka accompanied with assorted fruits, lavishly displayed in an ice sculpture bar for your drinking pleasure. Italian Countryside Station Imported cured meats including prosiutto, soppresatta, salami, olives and select cheeses. This station will also include your choice of two pastas and sauces prepared in front of your guests by one of our chefs. A Taste of the Orient Chicken or beef stir-fry with mixed vegetanles in an Asian style sauce cooked by one of our chefs in front of your guests. A variety of sushi and Sashimi will be displayed also. This station will be complete with wasabi, pickled ginger, and chop sticks. Dessert Stations: Viennese Sweet Station Sensational sweets to include cannolis, eclairs, cream puffs, assorted miniature pastries, whole cakes, and pies. Chocolate Fondue Fountain This is one to see, twenty five pounds of milk chocolate flowing through a four tiered fountain accompanied by strawberries, bananans, marshmallows, and pineapple for dipping. A dessert that no guest could ever forget. International Coffee Bar Freshly brewed coffee, cappuccino, and espresso served with Bailey's Irish Cream, Kaluha, Sambuca and also flavored syrups, accompanied by all the condiments needed to complete your coffee of choice. Anthony's Ice Cream Bar Mouth-watering homemade gelato, sorbets and sundae condiments for your guests to enjoy. This station will also include a chef flaming bananas foster, served over ice cream.